On the return trip to Ottawa from Aurora after the holidays, my wife and I stopped off just west of Trenton, Ontario at Highway 401 ONroute Service Centre to have lunch at the Tim Hortons (17277 Highway 401 Eastbound, Trenton). Visiting the "Trenton South" ONroute Service Centre on Boxing Day was a mistake. The first clue was the parking lot was overflowing with cars circling. Good thing we lucked out in the first row we selected one care was exiting as we were two spots away. SWEET! Second clue was inside. The A&W had two ques, one in front of the cash registers and the second across an aisle near the seating area to hold the number of customers. My wife and I ventured towards the Tim Hortons to find three lines also full. We then went over to the table area to investigate what the chances were of obtaining a table. Not good but at least passable if we were patient enough to swoop in at the right moment as someone was about to get up. We missed the first empty table but not the second. I ventured over to Tim Hortons and left my wife at the table by the window overlooking the awesome view of the Canadian Tire gas bar. The Tim Hortons line ups were interesting. Instead of the usual single line for all cash registers at other Tim Hortons locations, there were individual line ups up for each guarded by the ever friendly customer herding favourite, flexi tape pole system. I advanced slowly as there were five customers in front including the guy at the counter. I was hoping there was not someone in front of me who either couldn't figure out what they wanted or wanted to order 2 dozen worth of donuts. 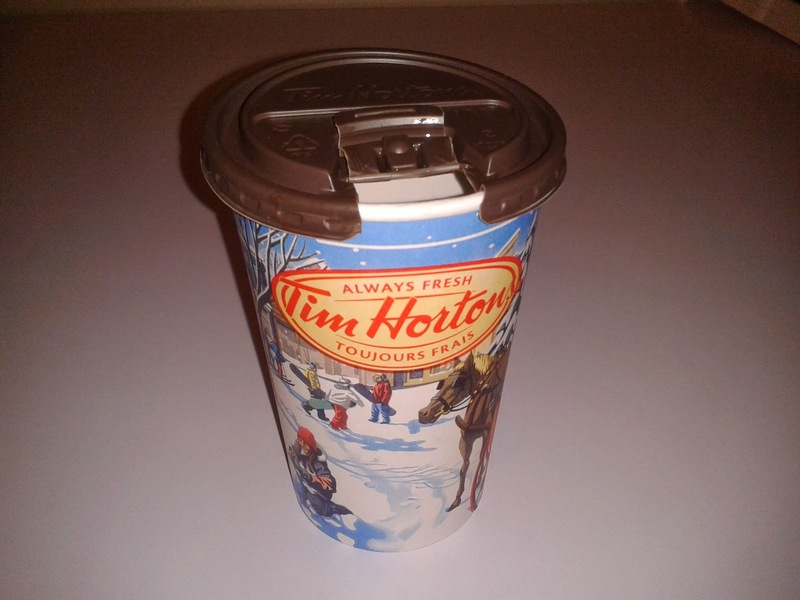 There is nothing more maddening to a Canadian waiting in a Tim Hortons line than either of these two situations. Eventually after what seemed like hours, perhaps 15 minutes, I was next to order. The Order: 1 Chili Combo with Whole Grain bun, a Raisin Tea Biscuit and Medium Green Tea and 1 Chili Combo with White bun, a Boston Cream Donut and a Medium Black Coffee. The food came fast both at the cash where the donut, raisin tea biscuit, tea and coffee were provided. Over a the bakery area our number was called the chili combos came out. This area was well staffed with what appeared to be a manager and three employees moving orders along. The only thing service wise this location could use is one additional cash in order to reduce the line lengths. But this being a newly refurbished service centre, an expansion is unlikely. The chili was delicious and the right consistency and temperature. The buns were the standard issue Tim Hortons buns that come with chili combos. The coffee was the same black coffee found at almost any Tim Hortons location in Canada that is following corporate policy. The only fun part was leaving. We gathered our leftover garbage and winter clothing. Before leaving the table it was dove upon by a family of three seeking refuge from the masses with their A&W meal. Overall, sure the ONroute Service Centre was busy with holiday travellers looking forward to either returning home or going to visit someone. Our Tim Hortons meal was standard fare and the staff seemed to be dealing with the rush well. The only complaint, it seemed there was not enough seating in the food court style area for customers to sit. In order to fully see if this is true, a return visit during a more standard day would be in order. Otherwise it is not a bad spot to find a quick lunch and hit the road again to wherever life takes you.